Figure 8-12. - Trailer-mounted machinery. Figure 8-13. - Rear of K-span trailer. 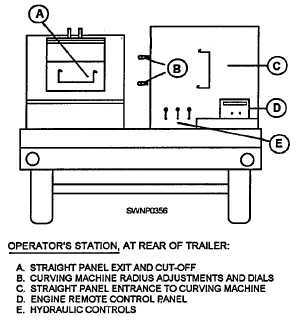 Maneuvering room for the towing of the trailer, or leave it attached to the vehicle (as shown at A). The length of the unit is 27 feet 8 inches long by 7 feet 4 inches wide (B). Allow enough room for run-out stands to hold straight panels. Stands have a net length of 9 feet 6 inches each(C). Find point X: From the center of the curve, measure the distance equal to the radius in line with the front of the curved frame. From point X, scribe an arc equal to the radius. This arc will define the path of the curved panel. Add 10 feet for run-out stands and legs (D). 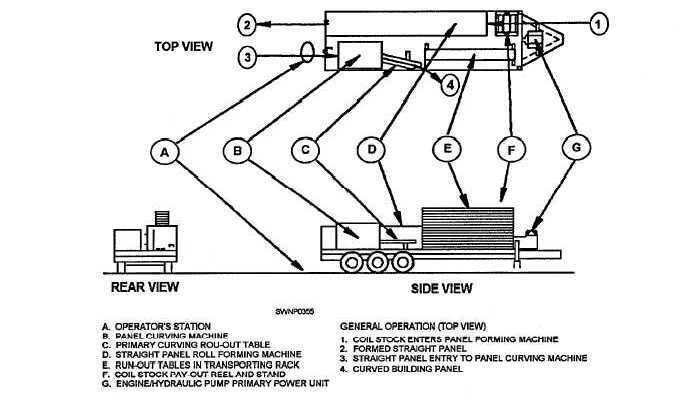 Storage area required to store the coil stock and access for equipment to load onto the machine (E).